As I read through this Christianity Rediscovered , I was struck by the author’s reflection on prayer as being a moment when we open ourselves up to the creative and redemptive presence of God. The author believes many Western Christians do not pray with this openness because they, just like in pagan thought, have trouble believing that God can suspend or interfere in the so-called laws or nature (p. 100). However, prayer grounded in biblical faith is open to the creative and redemptive presence of God who can and does accomplish his will even when such will seems impossible. But what happens when, in prayer, we open ourselves to the creative and redemptive presence of God…to surrender with a “your will be done” posture? Since biblical faith knows that God’s redemptive goal (telos) is victory for both himself and his people (cf. 1 Cor 15), we need not to fear being open to the creative and redemptive presence of God…right? Jesus not only taught us how to say that prayer [The Lord’s Prayer]. He said it himself on the darkest night of his life. At that terrible moment, when he fully realized just what it was he was being called to, he once again prayed to that “Abba” of his. He asked for his daily bread, which in this case was to have that cup, that cup of poison, taken away from him. And then instead of asking a remote God to work his miracle “over there somewhere’ far away from him, he spoke that word which cost him dearly – “fiat.” Thy will be done. And by that word he opened himself up to the creating, redeeming power of God within him, and God’s powerful work would be done, not outside him but in him, and he himself would be part of and involved in that deadly answer to his prayer. Perhaps Americans and other Christians do not pray anymore because they are afraid to pray. It is a dangerous undertaking (p. 102). 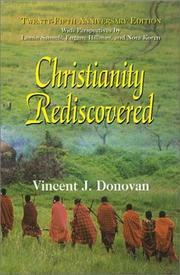 In this respect, prayer is not only risky but it’s an essential step in spiritual transformation where we open ourselves to God unto the point of saying “your will be done.” Thus Donovan goes on to say that the crucial question of prayer is “…whether we really open ourselves to him, open ourselves to his creating, saving presence” (p. 102). Yet this is the sort of prayer takes faith. It takes faith, knowing that hope is preceded by suffering, perseverance, and character (cf. Rom 5.3-5). It takes faith to continue on once we realize the great cost – the great grief and pain – that may be involved in allowing God to work creatively and redemptively within us rather than outside of us. Some days we think we have this faith, other days we are not so sure. Some days we want this faith, other days we don’t…because we are afraid? As much as we tell ourselves and others that fear has nothing to do with faith, fear is a reality. We must pray that the love of God will drive all fear from us (cf. 1 Jn 4:18). I realize the challenge of spiritual transformation is not just to pray but to have faith and to pray with faith. It is the challenge to pray with the faith that sees the victory God has sealed in the resurrected Jesus Christ. “But thanks be for God, who gives us the victory through our Lord Jesus Christ” (1 Cor 15.57, NRSV). This post is an updated version of a blog post from March 25, 2010. I thought I would update this and republish it in light of my last two posts on prayer from James 5:13-18. This entry was posted in Faith, Redemption, Scripture, Theology. Bookmark the permalink. we are saved by the Faith of Jesus. Union with Him sets the conditions for His Faith to be in us.